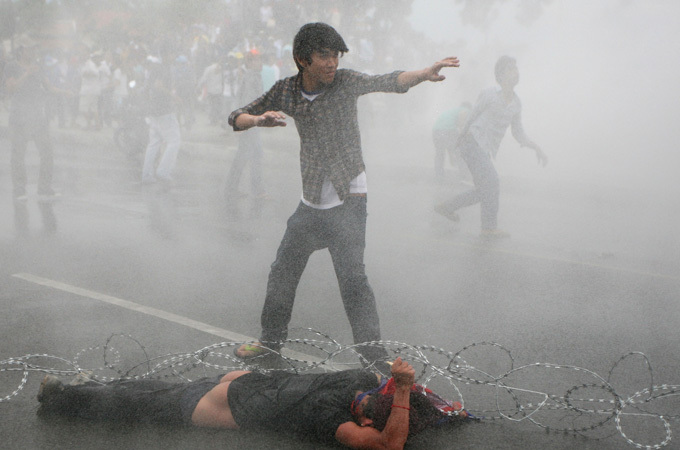 Phnom Penh, Cambodia – When volleys of rocks and bricks thrown between hundreds of rioting garment workers and police gave way to the sound of live ammunition, Sve Ka ducked for cover behind a large, plastic drink vendor’s cooler on Veng Sreng Boulevard. “Cambodia’s crazy!” the young woman said with a nervous chuckle as bullets whizzed by. By the time demonstrators cleared the streets and traffic moved along the busy road as usual, police gunfire had killed a 49-year-old street-food vendor and wounded at least nine others, according to a count taken by rights group Licadho and the Community Legal Education Centre (CLEC), a local non-government organisation. The initially peaceful march on November 12 marked the three-month anniversary of the day garment workers at SL Garment Processing (Cambodia) Ltd walked off the job in protest over low wages and working conditions at the factory, which supplies Gap Inc and H&M. SL also supplied Levi Strauss & Co, until the brand stopped buying from the factory in August. With just $4.45bn in exports last year, according to the Garment Manufacturers’ Association in Cambodia, the country’s garment and textile industry accounted for more than 80 percent of its total exports in 2012. SL is among Cambodia’s largest factories. Internationally, Cambodian garment workers are often seen as enjoying comparatively better conditions than factory workers in other Asian garment producers such as Bangladesh. But problems with ventilation and workers fainting en masse because of poor nutrition are a common occurrence in Cambodian factories. Although the ruling Cambodian People’s Party earlier this year raised the monthly minimum wage for garment and footwear workers from $61 to $75, a joint study released in September by UK-based Labour Behind the Label and CLEC reported that single workers need an income of at least $150 to cover their basic needs. The same study found 25 percent of the 95 workers sampled were seriously malnourished. Strikes at Cambodian garment factories are endemic, but often short-lived and end with few, if any, concessions from factory management. Calamity ensued last week when about 600 striking SL employees – along with staffers from the Cambodian Labour Confederation and the Coalition of Cambodian Apparel Workers’ Democratic Union (CCAWDU), which represents a large majority of SL’s 6,000 or so workers – clashed with police officers wielding riot shields and batons at Phnom Penh’s Stung Meanchey bridge. The show of force blocked the march from the factory to the home of Prime Minister Hun Sen, where they intended to hold a demonstration. Observers say the police blockade ignited an explosion fuelled by months of SL’s seemingly insincere negotiations with employees, hostile labour policy, and government indifference towards workers’ rights. The strike began on August 12, when about 4,000 workers at the SL 1 factory left work in protest against the presence of armed military police inside the factory. Company shareholder Meas Sotha said the move was part of an effort to protect the factory, but union representatives perceived it as intimidation meant to expel the union. Workers at the SL 2 factory also joined the strike, and CCAWDU listed a number of employees’ demands: a raise in their minimum monthly salary from $75 to $150, a $3 per day subsidy for their lunch, and the ousting of Sotha from SL. Government officials mediated several talks between the union and the company, but they all ended in deadlock. Kong Athit, CCAWDU’s vice president, said SL management refused to take employees’ demands seriously, giving union officials take-it-or-leave-it responses. SL’s general manager did not respond to repeated calls for comment on the situation this week. Employers refusing to negotiate with its workers is common in the Southeast Asian country, said David Welsh, country coordinator for labour rights group Solidarity Center/ACILS. The government is often unwilling to enforce these laws, said Moeun Tola, head of the labour programme at the Community Legal Education Centre. The legislation forbids employers from discriminating against union activism, and imposes penalties such as fines and one-month imprisonment for violators. During last week’s demonstrations, the growing number of protesters hurled rocks and bricks at police, who then unleashed water cannons against the crowd. Police retreated across the bridge, leaving at least three officers trapped in the Stung Meanchey pagoda complex. One officer managed to escape from a police truck, which demonstrators later flipped over and burned in the street. At least two took shelter in the complex, but were stripped of their batons, shields and body armour by protesters. The police, at that point numbering more than 100, advanced across the bridge firing tear gas, rubber bullets and live ammunition into the crowd. Toak Tin, a monk at Stung Meanchey pagoda, said he witnessed police officers shoot two unarmed demonstrators inside the pagoda complex. After the onslaught, family members of Eng Sokhom, a 49-year-old rice vendor who was not involved in the demonstration, said she was shot in the chest and died before arriving at a local hospital. Police arrested 37 people, including seven monks, according to a count by the United Nations’ Office of the High Commissioner for Human Rights. Rights groups and politicians within the opposition Cambodia National Rescue Party immediately decried the use of lethal force against unarmed protesters. “According to peaceful demonstration law … anyone who creates violence [during a peaceful demonstration] can be punished under the law,” said Yim Sovann, a CNRP spokesman said. Party whip Son Chhay echoed the sentiment, calling for the prosecution of Phnom Penh Municipal Police Chief Chuon Sovann, after Chhay visited gunshot victims a day after the riot. “This is not the first time,” Chhay said. Calling the SL demonstration “peaceful” does not accurately describe the rock-throwing, car-burning mob that police shot at, said Ken Loo, secretary general of the Garment Manufacturers’ Association in Cambodia. The Ministry of Interior has formed a committee to investigate the shooting, said Council of Ministers spokesman Phay Siphan. The factory is on holiday for Cambodia’s Water Festival, and is not scheduled to reopen until Wednesday, Athit said. Until then, CCAWDU is in wait-and-see mode, as they are unsure whether SL will obey the order, or if the union will end the strike. Although the government seems to be stepping in on the workers’ behalf in this case, Tola of CLEC doubts it will lead to widespread reform in strike resolution, or police response toward demonstrators. “I don’t feel any optimism that the government will change its tactics. It sounds to me like they’re incapable of it,” Tola said.